My NOTD is Rimmel's Lava Red, from the Lasting Finish Pro line. These retail for $3.49 (Meijer stores) and have the wider angled brush, much like the Sally Hansen Salon line. They have a shorter stem and a wider bottle neck opening, so for that reason, I prefer the design of Rimmel's brush and bottle system. I'm always afraid I'm going to knock the Sally Hansen bottle over because the opening is so narrow! Above & Below: Lava Red, shown outdoors using 2 coats, applied perfectly for me. The formula is just the right consistency, and dries quickly. 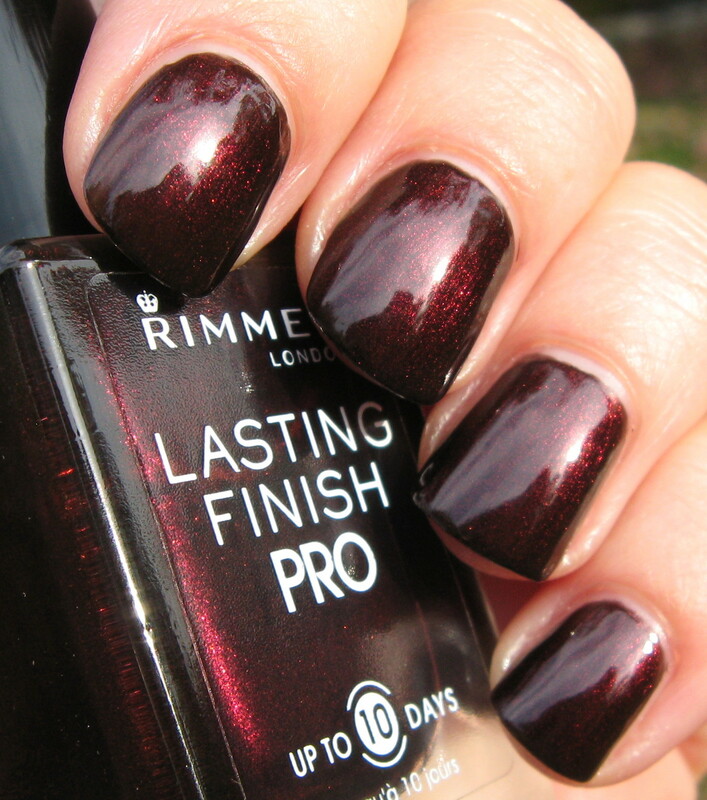 This black/brown based shade with a rich burgundy red shimmer has a glow to it, which I love. This is a great vampy shade for Fall, and I think it's also perfect for the Holidays. I especially like how the shimmer/glow shifts around on the nail. The black/brown base insures an opaque finish with ease, also gives a look that's sometimes a more brown with burgundy and sometimes more of a black with burgundy. I love everything about this line from Rimmel, from the substantially weighted square bottles, to the brush design, to the shades themselves. Isn't it about time for Rimmel to introduce some more colors to this line? Gorgeous! I definitely think Rimmel needs to add some new colors. oh wow, such a beautiful color! I'mma check some of these polishes! This is awesome! Reminds me of OPI Black Cherry Chutney. I was just going to say this color reminds me of the same, OPI Black Cherry Chutney. For less than $4.00? Amazing! 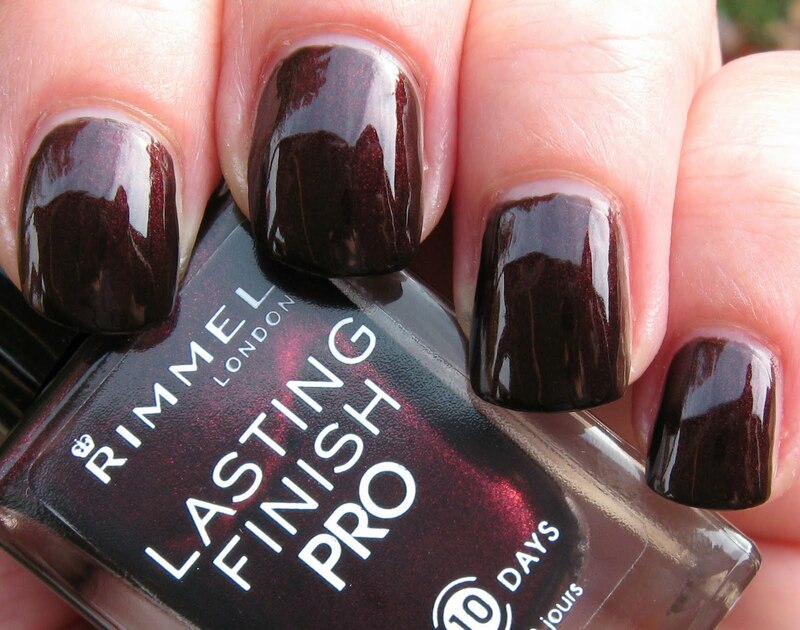 Rimmel can sell this polish for a low price. I wish they had more shades to choose from, "Lava Red" look fantastic on your nails, Mary. Love this color. Kudos. This is really pretty on you. I have Black Cherry Chutney so I can skip this beauty. 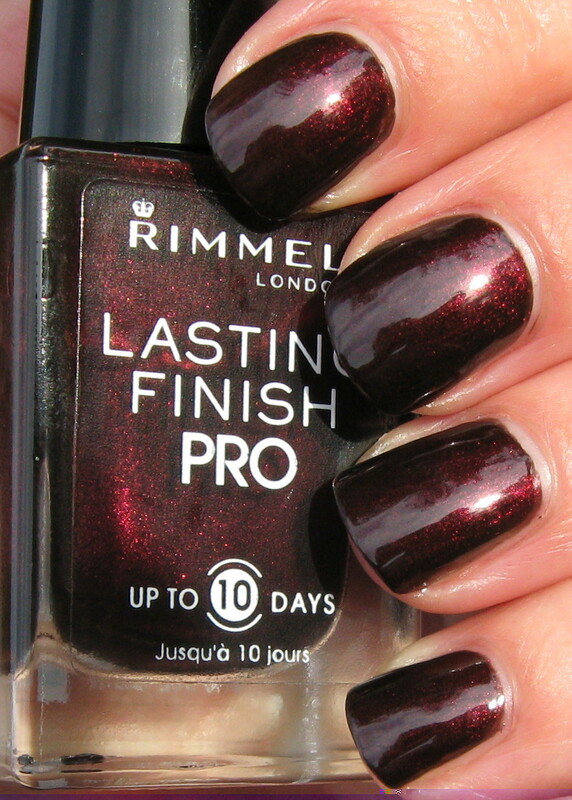 Rimmel is a great brand of polish. That's such a gorgeous color. I have this polish and love it. I agree--I wish there were more colors in this formula as well.